The indicator displays profit (loss) on the current symbol. 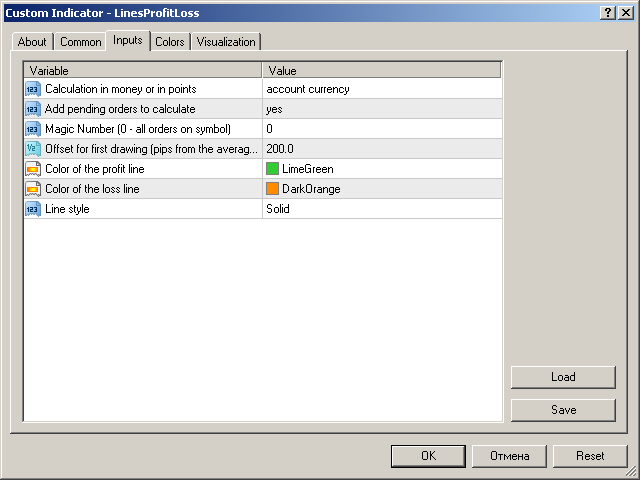 You can freely drag and drop the line to display the current profit or loss. Calculation in money or in points — calculate the profit/loss in points or money. Add pending orders to calculate — take pending orders into account in calculations. Magic Number (0 - all orders on symbol) — magic number, if it is necessary to evaluate specific orders. Offset for first drawing (pips from the average price) — offset of the line from the average price at first start. Color of the profit line — color of the line with profit. Color of the loss line — color of the line with loss. Line style — style of the lines. 1) Fixed coloring of the price on a black background. 3) Added a setting for the line style. Fixed the calculation of the commission.